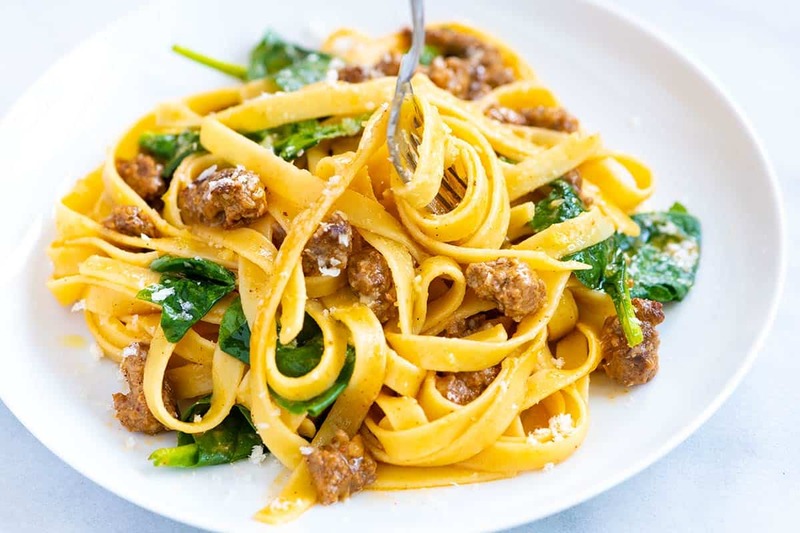 This easy fettuccine alfredo features a silky smooth sauce made with butter and parmesan cheese, cooked sausage, and lightly wilted spinach. You need less than 20 minutes to make it and there isn’t a splash of cream in sight. 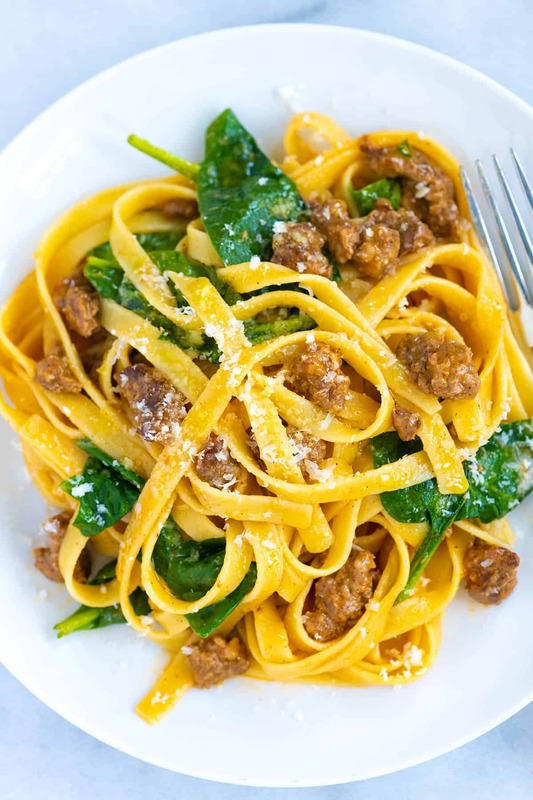 Jump to the Sausage and Spinach Fettuccine Alfredo Pasta Recipe or read on to see our tips for making it. If you’ve been looking at other fettuccine alfredo recipes, you might have noticed that heavy cream is usually on the ingredient list. We don’t call for cream (although, adding a splash towards the end of cooking wouldn’t necessarily be a bad thing). 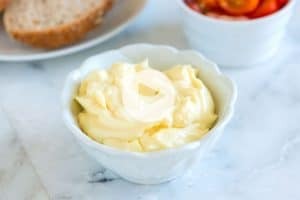 Instead of cream, our recipe relies on the combination of butter, parmesan cheese, and starchy pasta water. The starch in the pasta water thickens the butter and cheese into a velvety smooth sauce that coats the fettuccine noodles. 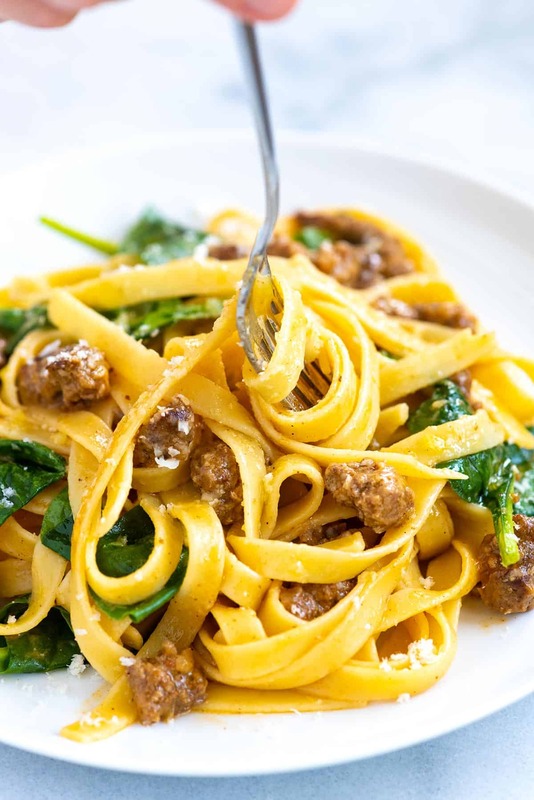 When you add cooked Italian sausage and lightly wilted spinach to the mix, this easy fettuccine quickly rises to the top of my favorite pasta recipes. It’s creamy, gorgeous, and utterly delicious. Fettuccine Alfredo with chicken is easy and delicious. 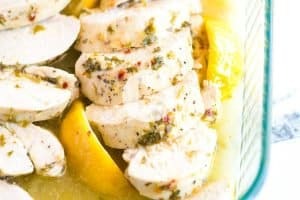 I love this lemon butter cooked chicken — in the linked recipe, we add it to spaghetti squash, but it would be fantastic with this pasta dish. Shrimp Alfredo is a classic. Add easy roasted shrimp on top or for even more flavor, use our garlic butter shrimp recipe. In that recipe, we call for cilantro, but you can leave it out or replace it with basil or parsley. Whether you add the sausage or try a different topping like chicken or shrimp, it’s the sauce that’s the real star. I love how the sauce isn’t goopy or thick and is velvety and smooth, instead. It’s just saucy enough to coat the pasta. It may not look like a lot, but gosh it’s delicious. This recipe reminds us of the pasta we enjoyed while visiting Italy. More often than not, sauces in Italy lightly coat the noodles — not too much, not too little. Everything seemed just a bit lighter (not calorie-wise, but texture). Salt the pasta water — America’s Test Kitchen suggests one tablespoon of salt for 3 quarts of water. It’s what we did for this recipe, and the pasta turned out perfectly. Don’t forget to reserve some of the pasta water, before draining the noodles. It’s the pasta water that brings the sauce together. Undercook the pasta by about 3 minutes. After draining, we add the pasta to a skillet with butter, parmesan, and reserved pasta water. In the time it takes to make the sauce, the pasta will finish cooking. When making the sauce, toss and stir the fettuccine noodles vigorously around the pan. It’s this action that turns butter and parmesan into an emulsified sauce. Serve fettuccine alfredo immediately. As the pasta sits, it soaks up the sauce so while leftovers taste good, you’ll miss that velvety butter cheese sauce. This easy fettuccine alfredo recipe features a silky smooth sauce made with butter and parmesan cheese, cooked sausage, and lightly wilted spinach. You need less than 20 minutes to make it and there isn’t a splash of cream in sight. Meanwhile, bring 3 quarts of water to a boil in a large pot. Add one tablespoon of salt and the fettuccine. Cook, stirring once or twice, for 3 minutes less than the suggested cooking time on the package. The pasta will finish cooking when making the sauce. Reserve 1 1/2 cups of the pasta cooking water then drain pasta. Add parmesan cheese, butter, spinach, 1 cup of reserved cooking water, and the drained pasta to the skillet with the cooked sausage. Set the skillet over low heat. Use tongs to toss the fettuccine, butter, and cheese around the pan for one minute. Take the pan off of the heat then cover the skillet with a lid. Leave for one minute. Uncover the skillet, toss the pasta a few more times in the sauce. If the pasta looks dry, add a splash more pasta water. If it looks wet, don’t worry, the pasta absorbs some the extra moisture as it cools. Serve fettuccine with a few grinds of pepper and a sprinkle of extra parmesan cheese on top. Store leftovers tightly covered in the refrigerator for up to a day. As the pasta sits, it soaks up the sauce so while leftovers taste good, you’ll miss some of the velvety butter cheese sauce. When reheating, add a splash of water to thin the sauce a little. 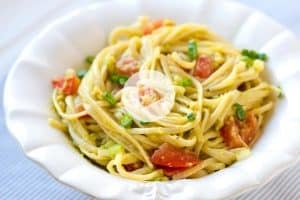 Recipe inspired and adapted from America’s Test Kitchen Fettucine with Butter and Cheese recipe. 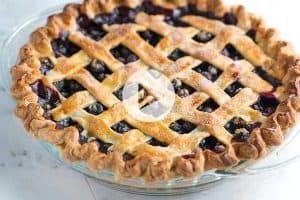 Quick to make and very delicious! Already cooked it two times! Just tried this. Very good! Hubby was trying to steal it from the pan! 🙂 Going on the Repeat List. We will probably up the amount of sausage next time, tho. Other than that, we’re happy!